This was a day I had been looking forward to since I started planning this trip: the American WWII landing sites in Normandy and the American Cemetery overlooking Omaha Beach. I was fortunate to have a terrific guide in Mr. Julian (Jules) Vernon, a former mechanic from Brighton, England, who in his spare time restored WWII jeeps, guns, and even tank parts. He vacationed in the Normandy area several times, fell in love with it, moved there and has been conducting tours for six years. He served in the Royal Navy and was also in the Army Reserves. He is incredibly knowledgeable and equally enthusiastic. I also had three delightful tour partners: Kevin and Pam, brother and sister from Oregon and Pennsylvania, respectively – he did one tour in Vietnam – and another Jules, a 20-year-old Aussie from Melbourne who broke off from some friends to feed his curiosity about war history. We started in the famous town of Sainte Mere-Eglise, which was such a critical spot for the back-end support of the evacuation from Utah Beach. Walking around the town there are macabre vestiges of war throughout the village … ricochet marks on fences, bullet holes in walls, chucks of missing brick. On the night of the invasion, tracer fire had ignited the roof of a house just east of the square (a museum is on that spot today). The church bell was rung and townsfolk came out and formed a bucket brigade while the Germans supervised, sleepy and amused. Our planes, flying somewhat blind from all the smoke generated by the bombing of German bunkers along the coast, mistakenly believed the fire was a signal and headed that way, and 600 feet above the ground the paratroopers jumped into a town that was all alight and where all the Germans were awake. 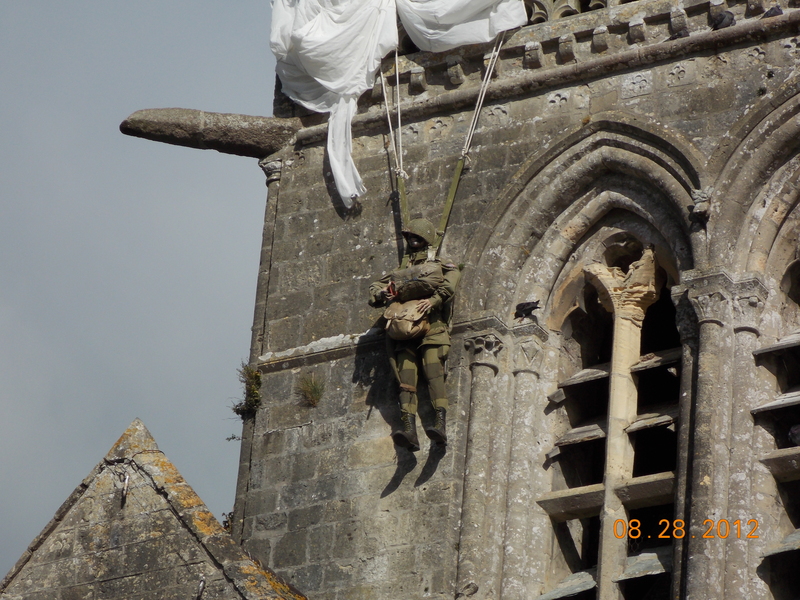 One paratrooper, John Marvin Steele, got his chute hung up in the steeple of the Catholic Church in the center of town, and the incident was made famous in the epic movie The Longest Day. Red Buttons played Steele, who survived, was taken prisoner and later escaped. There is a torn parachute and a dummy of a shoulder hanging from the steeple now, but the truth is that Steele dangled from a spire on the opposite side of the church. And it was on that side that the more interesting story evolved. Another paratrooper named Ken Russell got hung up also, on a fence lower down the church wall As he tried to cut himself loose he saw one of his buddies, John Ray, fifty yards to the left in the church courtyard, also trying to extricate himself from his chute lines. Russell watched in horror as a German soldier calmly walked up to Ray and shot him multiple times in the stomach and chest from point-blank range. The German then saw Russell hanging from the church, and again, calmly strolled over in front of him, raised his gun … and dropped to the ground dead. He had taken a bullet to the head from the gun of John Ray who, on one knee, the life draining out of him, had managed to unholster his pistol and through the fog and the smoke get off a one in a million shot. Russell looked at his watch the moment it happened: it was 1:35 a.m. In June of 2004, 60 years later, Russell and his wife returned to Sainte Mere-Eglise, where he was feted and welcomed as a hero, with the big celebration of course on the 6th. A weary Russell went to bed early, and the next morning his wife found he had passed away during the night. Later that day the coroner determined that the time of death was 1:35 a.m., 60 years to the minute after John Ray’s dying shot had given Russell another 60 years of life. 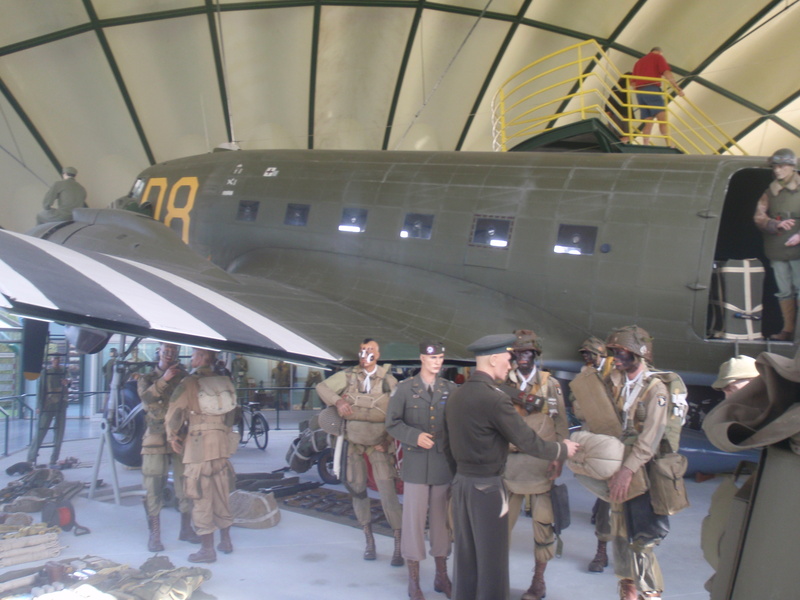 “In all the years since the war, when they’ve returned to France, the paratroopers have been like movie stars,” said Jules. “They get mobbed wherever they go, you can’t get near them.” And because of them, by 4:30 a.m. the town belonged to the good guys and the road from Utah Beach was open. We went down to Utah Beach – “The Forgotten Beach”, Jules calls it – and it was all so pastoral, and the beach so wide. 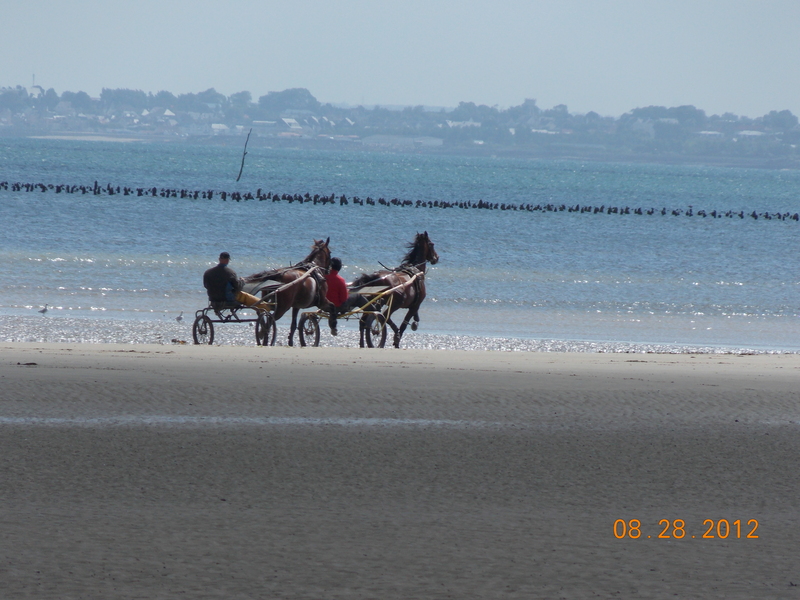 A local stable was working out trotters on the firm sand down by the water. The beach is three miles long and is the western-most of the five beaches used in the Operation Overload invasion; Omaha is the next beach to the east, followed by Juno, Gold and Sword Beaches, which were the primary landing sites for British and Commonwealth troops. Utah was a late addition to the invasion plan when additional landing craft became available. German resistance was minimal because of effective pre-invasion bombing, and the U.S. 4th infantry division, despite landing in the wrong place, suffered relatively few casualties in capturing the beach. The paratroopers lost 60% of their numbers but still did a masterful job of sealing off the back end and clearing the roads from the beach. In all, 23,250 troops and 1700 vehicles, including almost all of the DD “swimming” tanks, landed safely on Utah Beach. 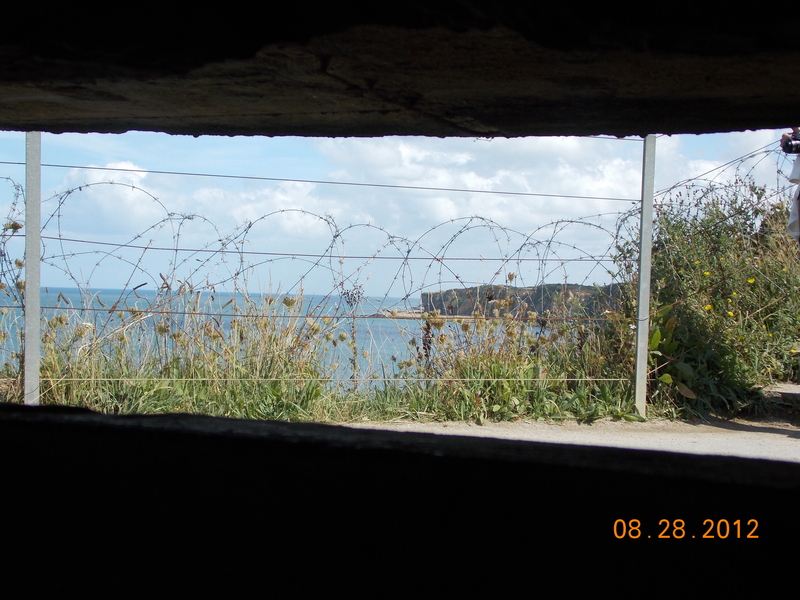 We stopped at Pointe du Hoc, a strategically critical beachhead jutting out between Utah and Omaha Beaches. German artillery sites (using French guns) could have reached both, but three Ranger divisions landed on the beach, ascended the cliffs and took the point. Allied forces blew up a massive ammunitions bunker, and enormous pieces of the concrete roof of that bunker, weighing between 8 and 20 tons each, lie strewn about the area today. Jules couldn’t hide his respect for the great German Field Marshall Erwin Rommel, who Hitler brought in to assess the coastal defenses. The “Desert Fox” added three major elements. First, he flooded all the fields leading away from the beaches, as well as the lowlands near the beaches. As a consequence many of our paratroopers drowned as soon as they landed, wearing 250 pounds of gear in water six or seven feet deep; also, our troops heading inland from the beaches were totally without cover on the roads between the flooded fields. Finally, Rommel had added the infamous “Czech Hedgehogs”, the famous wooden fence-like structures that were encased in concrete and designed to rip the treads off the tanks and the undercarriage of other vehicles. Rommel called his fields of mines and hedgehogs “Devil’s Gardens. 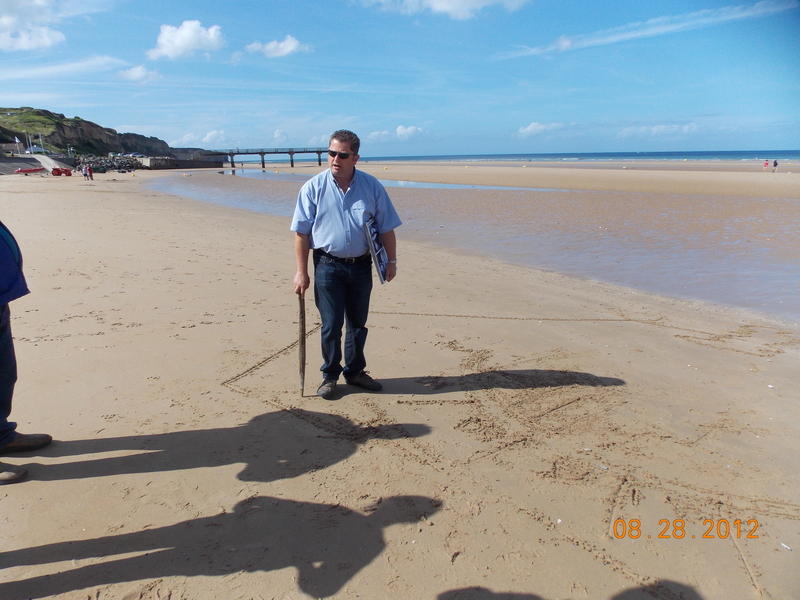 Omaha Beach was a vacation destination for the French before the war, and it is again, and as Kevin, Pam, Jules and I gathered around the other Jules to watch him diagram the battle in the sand, sunbathers wandered by, some curious, some irritated. The beach is 4 ½ miles long, but the striking thing is the tide: there is an 800 meter difference – half a mile – between low and high tide. Nothing went as planned that day. Tanks, jeeps and halftracks were lost in the deep water, men going down with them. Engineers landed in the wrong plan without their equipment. Because of the smoke and chaos, bombing intended to take out the German’s beach bunkers happened too far to the south and killed mostly cows. Paratroopers landing in the flooded fields either drowned or had to abandon most of their gear to survive. Communication was almost nonexistent, leadership almost impossible. In the first minute of the invasion, 64,000 German bullets riddled the beach, and there was no relief. 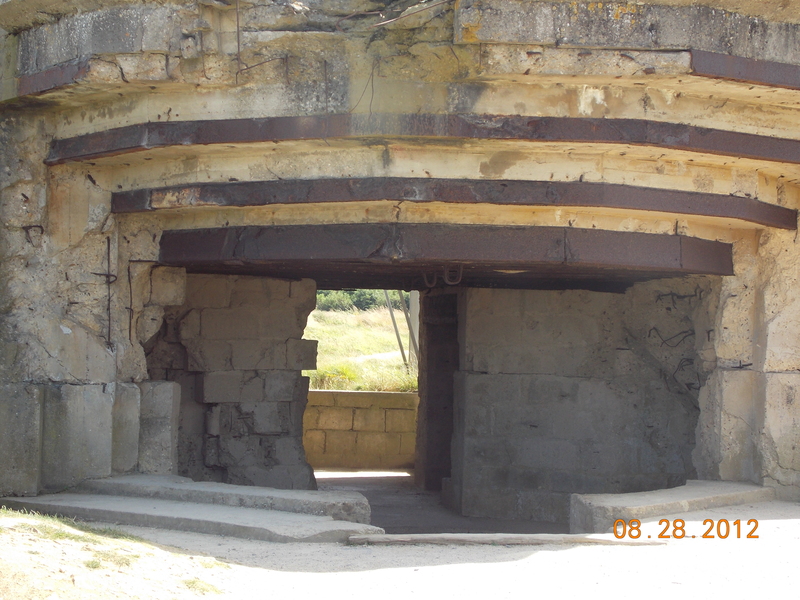 But a larger second wave stretched out along a greater portion of the beach was joined by Rangers who had been successful at Pointe du Hoc, and together they managed to secure two small areas that allowed troops to start working inland to join other forces. It was tenuous, but the inland access held, ultimately determining the outcome of the Battle of Normandy and, according to Jules, the war itself. “If we’d lost at Normandy, Truman would have had to drop the atomic bomb on Berlin,” he said. More than 4500 Americans were killed and wounded that first day, and the Battle of Normandy continued for another three and a half months. What was most striking was the massive scope of the invasion. You watch Saving Private Ryan or a History Channel documentary and it’s all so compressed, just a little slice of beach here, a small road leading through a village there. But when you stand on Utah or Omaha Beach and look for miles to your left and right; when you see a point of land that is 10 miles away and know that four more landing sites are on the other side of it; when you look out to sea and try to comprehend that there were more than 1000 Navy vessels out there; when you drive along a road for miles inland and know that there were dozens of roads like this with GIs fighting their way to the next village, and the next; when you learn that for every man in combat, four more were required in support roles; only then does the magnificent scale of it all truly sink in. 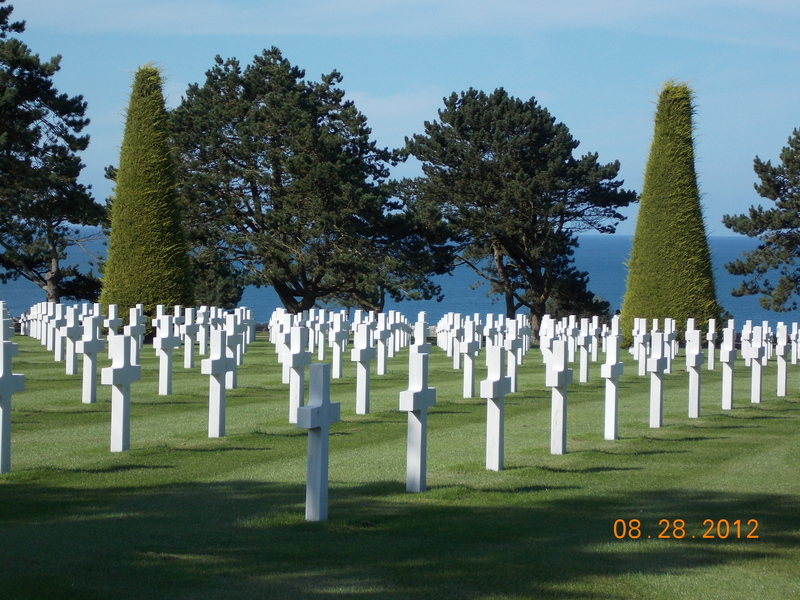 Our final and most emotional stop was the American Cemetery, so beautifully maintained on a piece of American soil on the bluff above Omaha Beach and the English Channel. There are 9300 G.I.s buried there, and the crosses seem to extend into infinity. I randomly chose four crosses and wrote down the names: Louis L. Bertoline, a sergeant from Michigan; Willis G. Peele, a first sergeant from North Carolina; Rocco J. Calvino, a pfc. from New York; and Anton L. Nunnikhoven, a staff sergeant from Mississippi. I hoped that when I had a chance to google them I’d find a robust backstory for at least one of them, but I didn’t, and of course that’s the heartbreak of it. Looking across acres of monuments you realize that most of them honor kids who joined the service right out of high school. They never had time to build a life. I finally had a chance to check your blog – fabulous!! I look forward to keeping up with you on the rest of your journey – where is Asia are you going? Also, I just returned from Cuba (via another country) and I would suggest that you visit there before coming back to the States.